Skaafin are a race of Daedra found in the Fields of Regret that serve Clavicus Vile. In appearance, they have yellow skin, red eyes, long black horns on their head, with blonde, brown, or bald haircuts. Physiologically, they resemble Altmer and Dunmer, having pointed ears and similar facial structure, though they come in varying sizes between three to six feet tall. The Skaafin appear to have some form of a caste system; the taller Skaafin have more sophisticated weapons and stronger armor, often serving as leaders. Skaafin smaller in stature are more feral, having a primitive vocabulary and fight using little more than their hands and magic. When manifesting on Tamriel, Skaafin are known to corporealize rapidly out of Chaotic Creatia, sprouting from the ground in orange-colored goo. Skaafin can use a variety of spells, such as projectile flares, and masquers can create "Masques", spectral clones that explode to attack their target. They are known to communicate using mirrors, showing what is on the other side of a different mirror instead of a reflection. As shapeshifters, Clavicus Vile and Barbas are known to take the form of Skaafin outside of their domain. The Herne may be a clan or type of Skaafin. During the Daedric War conspiracy in 2E 583, the forces of The Triad began using Skaafin as their minions on Tamriel. 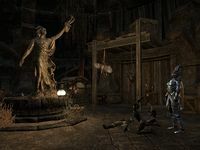 In Vvardenfell, they sabotaged a Tribunal Temple mission to Andrano Ancestral Tomb, with even Vivec knowing so little about them beforehand that he described them as "strange daedra". They would soon after appear in Odirniran and Kaushtarari to retrieve Sunna'rah, storming Seht's Vault after they obtained it. Having entered the Clockwork City, they were also found in the Ventral Terminus protecting Chancellor Gascone Dusant. In Summerset, they mysteriously appeared in the Monastery of Serene Harmony in Shimmerene, later discovered to be the work of the Court of Bedlam. When Cyrus visited the Fields of Regret in 2E 864, Clavicus Vile held a game for him to win Iszara's soul at the risk of losing his own soul, where each result was hidden between two doors. In order to figure out the riddle, Cyrus had to consult two guardian daedra; one would always lie, and one would always tell the truth. For game-specific information, see the Redguard Guardian article and ESO Skaafin article. This page was last modified on 7 April 2019, at 19:36.